Mr Sheraan Amod of Recommended Medical (RecoMed) Practitioners, a company registered in South Africa that helps patients book doctors, dentists and respective healthcare providers online, said on the 1873 FM radio Drive Show hosted by Wildfire DJ on Monday, 15 October 2018, that for innovative provider placement platforms are a prerequisite asset for Sustainable and Smart Healthcare. Mr Amod will be a speaker at the 4th Healthcare Innovation Summit Africa that will start on 17 through 18 October 2018 in Johannesburg, South Africa. The 1873 FM radio in collaboration with the organisers of the conference, ITnews Africa, is hosting on its Drive Show a number of interviews with speakers at the conference focusing on the power of technology in accelerating and optimizing healthcare solutions. The 1873 FM is also promoting an initiative called Banking on Africa’s Future whose main objective is provide a platform for shapers like Mr. Amod who was based in the USA but came back to South Africa to play his part in improving efficiency in the supply value chain of healthcare, to share their experiences and insights as well as provide a convenient home for people to know the individual providers and their companies. The placement service is able to assist any patient to book anywhere in the country. 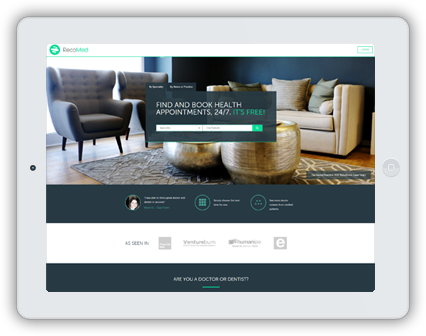 “Patients can instantly book appointments and acquire services of any healthcare provider on their database. I have always been interested in computer science and during my time in the US around 2012, I would book appointments online. That’s how I came to push ahead this technology entrepreneurship. As the case with any technology, Amod said that it took time for patients to know of the existence of the platform and some patients could not believe its value in giving them choices in relation to providers. Furthermore, for quality control purposes, he says it will not be difficult to do a pre-work assessment on doctors and to verify their qualifications. He added that people from rural areas are now starting to use his apps and he has also been invited to some Sub-Saharan countries to showcase the product. Amod agreed that the BOAF initiative is important not only because of the recognition and celebration of provider excellence but in inspiring others to join the profession. He said he would like to be part of BOAF for positive market distribution. “I am passionate about Africa and this is the reason that I sold my business in the USA, my whole life is about playing my part in Africa’s development, let’s shine the light that needs to be shone,” said Amod. Amod is going to speak about healthcare technology disruption in Africa at the conference. “I will look at companies that did well, companies with million customers and those that came with electronic patients recording device and popularised it. The tech world has made things easier and better for all, and we need to utilise it,” he said.